I use the online organization tool Trello a lot with my work team these days. We are distributed across the country, and so we need a shared workspace for leave and work planning that we are allowed to access from our network. Of course we can’t use it to share protected documents, as it is not a particularly secure workspace and has social components that potentially could be exploited – but as far as it goes, Trello works well for a visual planning and calendaring tool and I’ve grown quite attached to doing all my work planning in it. So of course, when I decided the other day to take a run at organizing my pattern stash (and eventually, fabric stash), and also creating a staging ground for planning garments – it was a no brainer that this was the tool I chose to use. I thought this was pretty original until I did a google search and saw that at least two other sewing bloggers have written about using Trello this way – of course! I’ve tried to organize stash in the past using Zoho – which is a decent online database creator. Unfortunately I never found it convenient enough to actually go back and page through it for ideas. It also wasn’t aesthetically nice to work with – and a bit of a drag to figure out. 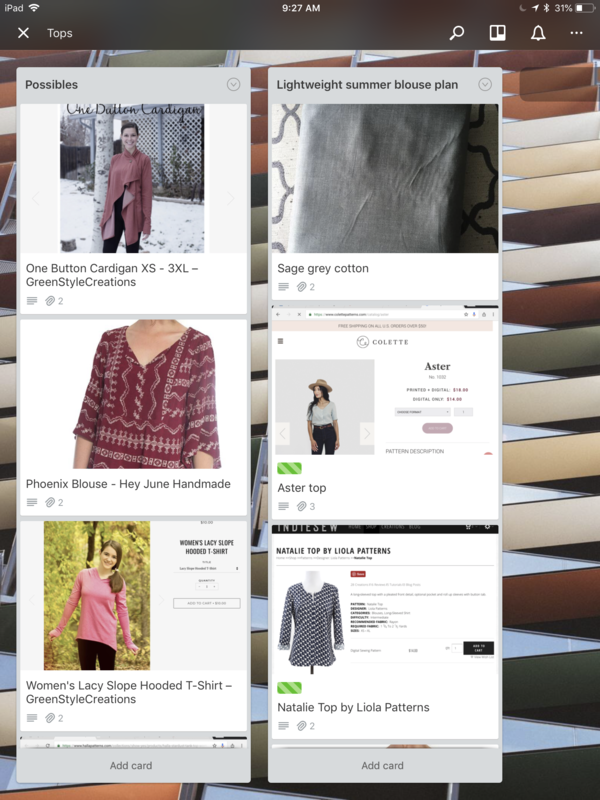 Lately, I’ve been keeping links to patterns I want to try (but don’t necessarily own yet) in Google Keep – which isn’t at all visual and was getting a bit messy. While I know from my work in information architecture that everyone has their own way to organize information that seems logical – I determined that the best way for me to organize is by garment type: Tops, Outerwear, Pants, Statement pieces – and so on. Plus I’ve made a list for Fabric stash, Textile art ideas, and Completed projects. I want to use this less as a showcase for what I’ve done, and more as a quick tool for noting ideas, materials, and pattern matches. The Trello landing page which shows my main boards in alphabetical order. Within each of these sections organization happens within “lists” and “cards”. As my main interest in using Trello is for organizing my next projects, and capturing patterns I am interested in pursuing I have started a list on each board for possible patterns (labeled Possibles). That list contains a card for each pattern I am currently interested in and if I own the pattern already, I label it with a green tag. Other lists on the board will be used to plan my next project(s). In the example below I have created a list for a lightweight summer blouse. Into that list I have copied a fabric “card” from my fabric stash board, plus three pattern cards from my list of possibles because I’m not sure exactly what I want to make yet. If I wanted, I could create another board for Notions stash and copy in any notions that I own that are suitable for the project. My Trello board for tops, with a plan for some fabric and potential pattern options. Once I have decided and made the project, I would eliminate the cards that did not get used (the patterns I didn’t choose for example) and then file that list under the Completed projects board. Features that I also intend to use include the checklists and due dates in each project . If you put due dates on items or tasks within an item, the calendar function in Trello allows you to see the dates for all your projects laid out alongside each other. For production or commission sewing – this is a real bonus. Of course this is just one way to organize patterns/projects/stash in Trello; there are other blog posts out there which share different organizing schemas. I think the way to proceed in setting up Trello as your sewing organization center is to determine your main goal and design from there. My main goal is *not* stash organization. It *is* a place to organize ideas and plan. This makes my organizing principles different than someone who wants to track all the patterns or fabric they own. Trello is available via your web browser, and there are also apps for Android and iPad. I use all three – and they all have pretty much the same functionality, though I do think that the iPad makes it easiest to add patterns directly from their weblink to your Trello account and boards.